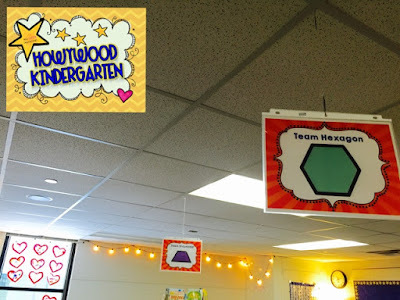 HOWYWOOD KINDERGARTEN! 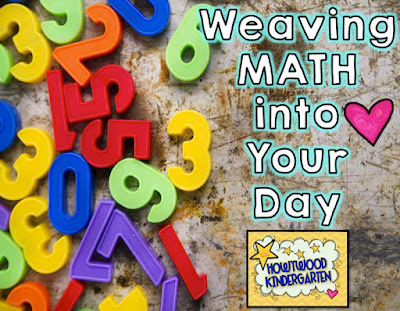 : Weaving MATH into your day! Looking for some simple ways to weave math into your daily life at school and really make it PERSONAL and meaningful for kids?! Read on! I even threw in a FREEBIE for ya! Wonderful Ways to Make ___ ! Check out this white board... if you have something like this or even just a corner of a larger board, you can make this happen! Each day, we change the focus number in the box to match the date. So for example, this picture was snapped on February 17 and we focused on 17. Throughout the day as kids have spare time they are free to go to the board (which they love, right?!) and jot down a way to make the number! They're supposed to sign their name by it. At the end of the day, we take a moment to discuss these ideas. If any are wrong I gently fix them up so they work. They learn from each other and feel proud! This takes literally 2 minutes or less per day. And it's worth noting that this picture was taken on only the second day we did this. Now, 2 weeks later, they're already coming up with much more complicated ideas already. It's exciting!! 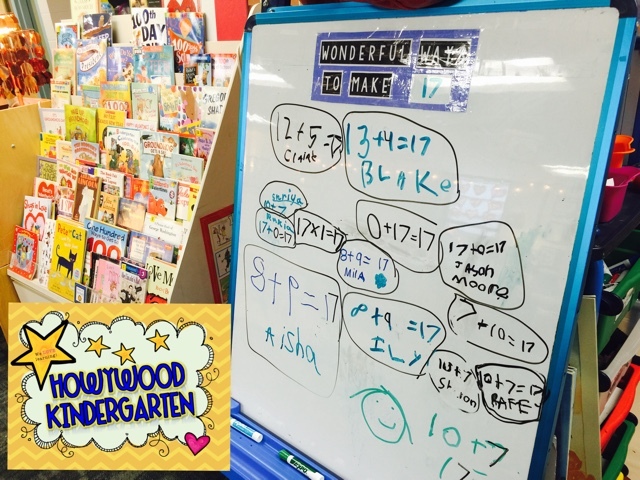 I have done this other years too and parents would start freaking out to me about how their children are coming up with all these amazing ways to make numbers! Like, "How do they KNOW these things?!" I always just agreed with them about how talented their kids are, but smiled to myself because I know their thinking was probably inspired by this awesome activity! Way to go, kiddos! This is one I always kick off the first few weeks of school with. EVERY DAY we sing Dr. Jean's "Numeral Writing Song" (find it @ the top of this page here) and EVERY DAY we follow it up with the "123 Challenge." Before you know it, EVERYONE knows how to write and name their numbers! And I know it's mid-year right now, but if you haven't done this yet-- try it out! Use your screen to project (or just print and flip through the pages like a book) the pages of this file. It's just big numbers between 1 and 31, all mixed up and out of order. 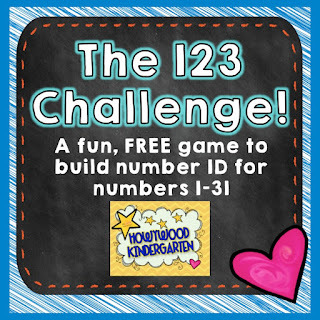 Choose one lucky student and ask them if they're ready to accept the "123 Challenge." They can say yes or no. I usually begin purposely with students I know will do awesome to give those who need more time to learn and study time to soak it in. But if anyone says they want more time, that's perfectly fine and you pick someone else and come back to the other student some other day. The student stands at the front by the screen and names the numbers as you show them. EVERYONE is watching quietly and naming the numbers in their heads. They need to pay attention because they never know when the person will need to "phone a friend!" If the student in the spotlight gets tripped up or needs a hint they can ask the audience/phone a friend and have someone help them out. No big deal. I make the kid repeat it for themselves and it "counts" as correct! Yay! Once they complete the challenge, they earn a big round of applause and get to sign their name on a big paper on the door of our classroom so the WHOLE SCHOOL can see what hard workers we are in Kindergarten! I also give them a sticker (just an address label) that says, "I'm a hard worker! I completed the 123 Challenge!" Keep playing everyday until every student has had a turn. You can get a copy of the directions and the # file HERE for FREE! Yay! One more simple idea. I noticed my kids were having trouble with a few tricky shapes. 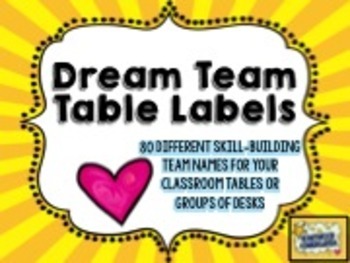 My tables used to be labeled 1-4, but then I remembered about my Dream Team Table Labels!! I whipped them out and it was instant success! You need to grab this! It's like magic how fast it helps kids learn stuff! See the Team Hexagon and Team Trapezoid signs? 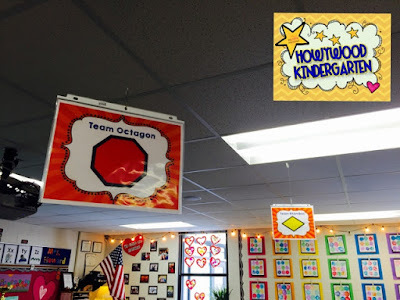 And here we have Team Octagon and Team Rhombus! I refer to their tables often... like, "Look out how neat and clean everything is over at Team Hexagon!" Or " Team Rhombus, you may line up first!" So they immediately identify with THEIR table and they look up to see the shape (these are just hanging with paper clips and fishing line in a page protector... easy cheesy!). Next week I'm going to switch out the team names to focus on a new skill like teen numbers, coins, vowel sounds, or more! I have a handful of kids who are so confused about how to write the #12... so guess who's gonna be sitting at "Team 12" soon?! :) The set includes 80 different skill-building options that can be mixed and matched or coordinated... whatever you like and whatever your kids need! If you're allowed to hang stuff from your ceiling and have kids sitting in groups, your class would LOVE THIS!! 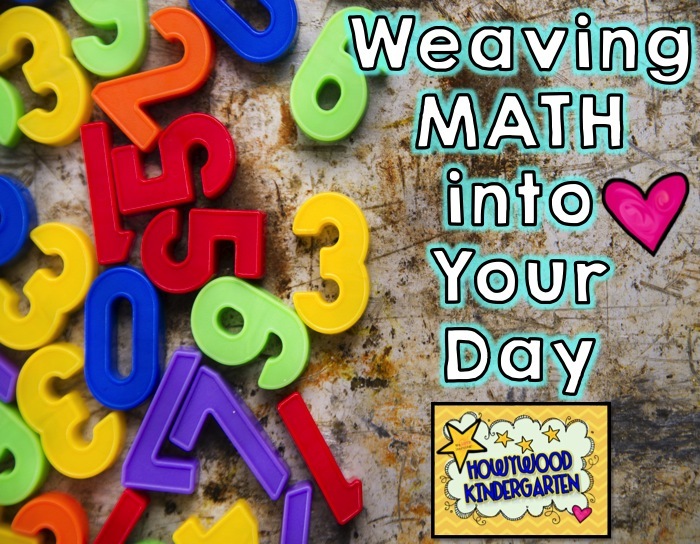 Well... hope you snagged a few great ideas on how to weave MATH into your day! Thanks for reading! Great ideas! You make me want to teach Kindergarten! Thank you for sharing and participating in the linky.